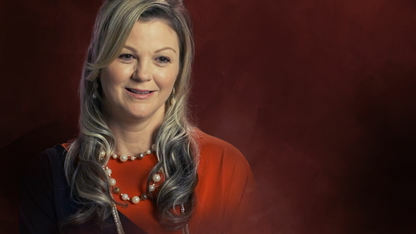 Chickasaw citizen Christie Volkmer is a truly multitalented individual, exhibiting the typical Chickasaw characteristics of dedication and a strong work ethic. Her great-great-grandfather is Benson Pikey, a notable Chickasaw figure who survived the Trail of Tears and was Speaker of the House in the Chickasaw Legislature. He established Pikey's Crossing on the South Canadian River, which was a very important ferry crossing connecting Chickasha and Oklahoma City until 1932. Christie has been a flight attendant for Southwest Airlines for the past 16 years. She currently lives in Choctaw, OK, with her husband, baby daughter, and six pets – two dogs, a macaw, a cat and two miniature colts. In 2009, Christie was a contestant on the 14th season of the television reality show "The Amazing Race." She and a fellow flight attendant were eliminated during the sixth leg of the show, traveling from Russia to India, and placed seventh overall. She was also featured on "Enlightened," the 2011-2013 critically acclaimed HBO comedy-drama. Christie notes her children’s book series, "Talon Tales," as her greatest professional achievement. The collection of stories features her personal pets and a boy named Talon, who adopts, rescues and saves various animals. Christie hopes the books will entertain kids while also teaching them valuable life lessons and promoting responsible pet ownership and adoption.